Goodbye, Power Rankings. You were mostly fun, but it’s time to welcome in Bracketology. Here’s the thing though. It’s probably still too early for this. BUT IT’S FUN. It’s fun to guess at what the tournament lineup would look like based on what we know today. Because it’s so early, a lot of this can and will change. It’s impossible to do Bracketology without predicting results for a lot of teams, and we have plenty of reason to believe that predictions are not a science. 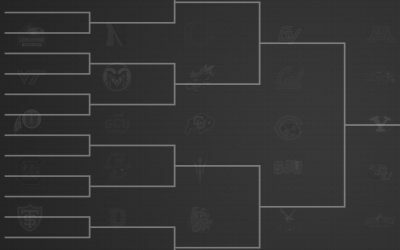 That said, seeing the bracket mocked out, and seeing who is on the bubble will hopefully give you an appreciation of the magnitude of some of the games coming up. Look at this quick list of games coming up just this weekend. You can quickly start to understand how important all of those games after you see where teams land in our first Bracketology. Even if your favorite team is firmly locked into a tournament spot, every game counts for seeding. How much does seeding matter? Stakes are high in April. Hopefully, this will help you enjoy the last month of the season even more. Onto the bracket! This obviously assumes Chapman wins out. If they win out I don’t see any way they don’t come away with the #1 seed, regardless of what any other team does. The SLC tournament is never a run-away, so they still have their work cut out for them, but the reward is big for getting the #1 seed this year. Assuming no major upsets in conference tournaments (a tenuous supposition, admittedly) the #1 seed will be the only team that has a first-round game against a team who wasn’t ranked at some point this year. I’m giving the UMLC AQ to Indiana for now. They have a 1 goal loss to Mizzou early in the year, but they have played some good lacrosse this year, including hanging tight with Davenport in an early season matchup. Regardless of who wins the UMLC AQ, we can be fairly confident that will be the only team representing the league in Salt Lake and they will be in the #16 spot. I broke from my power rankings to give a nod to Utah for this second spot. I wouldn’t have them ranked #2 in my power rankings if I did them this week, but I do think that if they can win out (not unreasonable to think), they will be locked into this #2 spot. To win out would mean they add wins over CSU, CU, BYU, and either CU/BYU in the RMLC finals. That’s plenty to lock them into a top 2 seed. The LSA is a conference that we could see an “upset”, but A&M seems like the front-runner right now. All of their losses have been to ranked teams, losing to Florida by 1, FSU by 1, and BYU by 5. If you played #15 vs #16 I’d expect Texas A&M to win, likely handily. It’s a big jump in team quality from the #16 to the #15. The #1 seed is a good deal this year. This is a big assumption that they make it through unscathed, but they have made it this far. They get their first real test in over a month this weekend against Virginia Tech. That will start to tell us more about how good the Gamecocks really are. On the other side, I think this is the spot the PNCLL AQ will land, regardless of who it is. They are another 1 bid conference that could go to 3 or 4 teams. Regardless of who it is, I think they will end up here. We give the early nod to Simon Fraser as the only currently ranked PNCLL team. I think this might be the ceiling for Michigan State barring some bad losses from other teams. My guess is that the RMLC AQ, SELC AQ, and the SLC AQ will all come in ahead of them. Michigan State is probably in “lock” territory right now for the tournament. Even if they were upset in the CCLA finals, they would still be in Salt Lake. At this point, they are playing for seeding. Best case scenario for them, win out and cheer for a few conference tournament upsets. Realistically the WCLL AQ could come in a seed lower if Simon Fraser wins out, but they will be right in this area. Cal gets the nod since they own the head to head over Poly in the regular season. An experienced tournament team is a tough draw in the first round regardless of their seed. It doesn’t matter if it’s Cal or Cal Poly, either team is not an ideal first round draw for anybody. This is where we seriously start projecting to seed the bracket. I have Colorado at the #5 seed, but to be here they would need to win all their RMLC games, except Utah. They would need to beat BYU twice, CSU once, and lose to Utah in the RMLC finals. Realistically, they will probably split somewhere. Beat Utah. Lose to BYU once. Easily in the realm of possibility. For the sake of simplicity for this bracket, they beat BYU twice, and lose to Utah twice. Even with 3 losses at that point, they would have one of the strongest resumes of wins in the league, which would snag them a top 5 seed. On the other side, we have our last At-Large team to get in. Right now I have this penciled in as Concordia, but they need to be near perfect to pull it off. They play the Gauchos this weekend, which is a must-win for their AL chances. A UCSB win would likely put Concordia in AQ or bust territory. For their resume’s sake, they should be cheering hard for New Hampshire to tear through the PCLL. There are a LOT of teams you could swap to this 12 seed. It’s going to be a dogfight to see who the last team in is. If UConn wins the PCLL and ends the season undefeated, I could see the tournament committee giving them a nod as high as the #4 seed. It will be interesting to see how the PCLL holds up through league play. In order to get 2 bids from the conference ideally, two teams emerge. In our hypothetically bracketology that would be UConn and BC, with UConn knocking off BC in the championship. There is potential for them to all kind of beat each other up and put the second team on the bubble and drop the AQ’s seeding. The SELC has the same potential scenario. For now, UConn rests at #6. On the other side, we have Georgia Tech, a tough matchup for the Huskies in the first round. In our projected scenario, the Jackets would have lost to the Gamecocks in the SELC semifinals. A number of GT’s losses early in the season came while they were missing some key pieces. If the Jackets make a run at the end of the season and find their way to Salt Lake they are going to be a bad first round matchup for a higher seed. Assuming Liberty can march to the SELC finals, even with a loss they will land in the top half of the bracket. The Michigan State win isn’t going to stop looking good, and they have a lot of chances to stack some more good wins during SELC play. Risk/reward, because that also means they need to survive a tough SELC schedule. They’ve proven their ability to win big games, now they need to show that they’ve added consistency this year. We get our first look at Boston College in over a month this weekend when they take on Rhode Island, but set your sights to next week when they matchup with UConn in a game that will tell us a lot more about how the PCLL will shake out. The Eagles need to add to their resume. When they stopped play a month ago their wins over Georgia Tech and Arizona State looked a lot better than they do now. They won’t be able to cruise into the tournament on those wins alone. They need to pick up multiple PCLL wins, but I don’t think that’s a surprise to them, or anyone else. The 8/9 game is going to be good no matter who plays in it. If it ended up with these two teams, it would be an absolute dogfight. My sense is that GCU is probably a tournament lock at this point. Barring a first-round loss in the SLC tournament they don’t have THAT much more that could wrong. Maybe a semi-final loss would put them on the bubble, but I think they have probably done enough to win some tie-breakers and land in Salt Lake. If they can win the SLC tournament they will be pushing a top 5 seed, which, as we mentioned above, means a lot. BYU is probably on the other side of the equation. I don’t think they are a “lock” yet. They probably need to win 3 more wins to lock themselves in. They play CSU, CU, Utah, UVU, and the RMLC playoffs. If they stack together 3 wins out of that stretch, they are a lock. Being a lock to make the tournament isn’t really what BYU is signed up for though. They want to contend for a championship. To make that a reality, they probably need 5 wins out of their next 6 games. If they can string 5 wins together they will have a good argument to be pushing into a Top 5 seeding. The RMLC is going to be fun to watch this year. Whoever comes in third is likely going to land right around here. There aren’t many easy games in the first round, but you want to do what you can to avoid the 8/9. Who knows though, Chapman broke the mold last year and made the Finals as a #9 seed. Maybe the tournament is shifting to see more upsets. Or maybe it was an anomaly. TBD. The Bubble is filled with teams that I think can still play themselves into a tournament At-Large bid, assuming they don’t win the AQ. All of these teams have enough opportunities to win games, not win their conference tournament and still end up in Salt Lake. If you want to know who is on the AQ bubble, make your conference tournament and you can be on the AQ bubble. Clemson – You might as well put every ranked SELC team on the bubble. If any of them go on a run through conference play they will have a solid shot. New Hampshire – I think the PCLL will send two teams at this point. It just depends on who it is. Similar to the SELC, if New Hampshire strings together a few in-conference wins they have a solid shot at an AL if they don’t get the AQ. UCSB – The Gauchos have 2 good opportunities to get top 10 wins. They have given great teams really good games this year (see Colorado). Beating Concordia would really bolster their resume (and probably knock Concordia out of an AL spot). Beating Chapman would really turn heads and probably lock them into a spot. Davenport – If they can’t snag the AQ out of the hands of MSU, it might be tough for them to get over the hump for an AL spot. The win over BYU will show well to the committee, but they don’t have much else to showcase. This might be “lower bubble” territory. Colorado State – I originally had left them off the bubble, but in reality, if they beat BYU, Utah, CU, and then one of those again, could you really leave them at home?